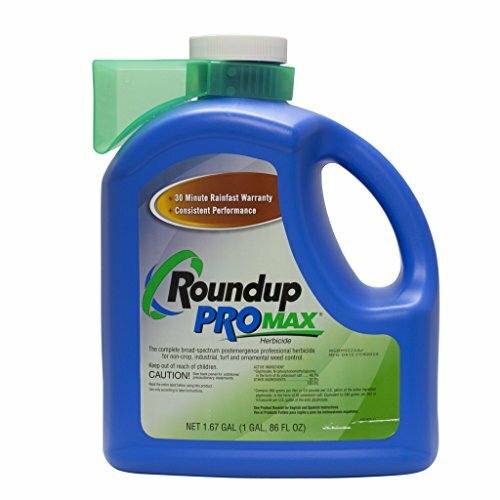 Roundup Pro MAX is a herbicide that penetrates the leaves and moves to the roots of weeds faster so that in can provide weed control, with virtually no regrowth. When you spray Roundup on a weed, it is absorbed by the plant, where it then prevents the plant from making its own food and gathering nutrients to sustain itself. Roundup is then transported throughout the weed to kill the entire weed, roots and all. Roundup PROMAX herbicide is used to control weeds and brush in professional vegetation management situations such as turf management, landscaping, roadsides, and utility rights of way.